A couple of weeks back, Motorola slashed the on-contract and full retail prices of the Moto X at AT&T by $100 to $99 (on-contract) and $479 (full retail) (MotoMaker included). At the time, we questioned whether or not we’d see a similar price drop from Verizon in the near future, since they are selling the exact same phone sans MotoMaker. They had also already dropped the prices of the entire DROID line, but for whatever reason held off initially on the Moto X. 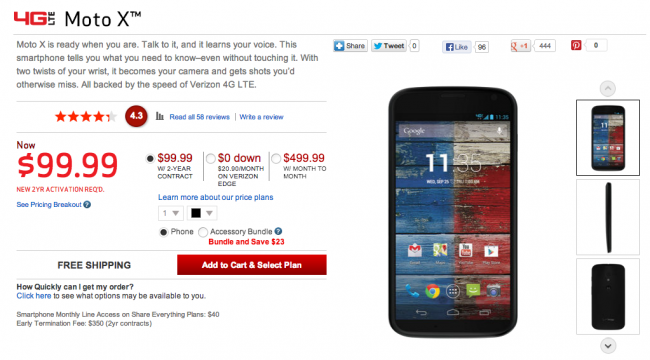 Well, the price on the Moto X is now $99 on-contract and the full retail price is $100 less as well, now at $499. If you were considering the Moto X, but didn’t like the price, I’m not sure you can do much better than this at the moment. We’re still huge fans of Motorola’s 2013 flagship, and may be missing it a tad already after taking on the Nexus 5 this week. There is something about the Moto X that continues to keep us coming back for more (Active Display, that beautiful feel in hand, etc.). Our full review is here if you haven’t read it yet. Just in time for MotoMaker, right?